Congratulations to our friend Roger for winning the 53bu Sakura Prize at the 2019 All Japan Young Koi Show! Rogers Goshiki took the 50 bu Goshiki “Yusho Jiseki” Award at this years All Japan Combined Koi Show back in early February. 2 months later Rogers awesome Goshiki moved up in rank and took both the Champion award for her size and class as well as the Sakura Prize at the Young Koi Show. The Sakura Prize is awarded to the best Koi from the following classes: Goshiki, Kawarigoi, Ginrin A, Ginrin B, Utsuri and Kujaku in each size. This entry was posted in Uncategorized on April 1, 2019 by koiadmin. 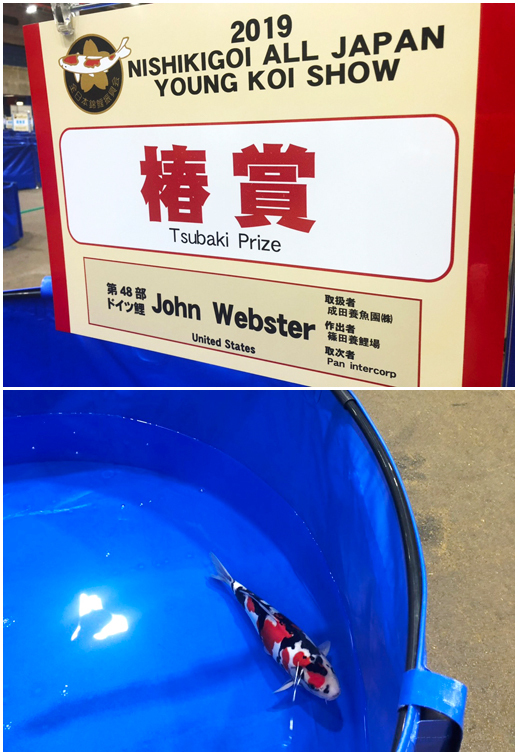 Big congratulations to our friend John for winning the Tsubaki Prize at the 2019 All Japan Young Koi Show! 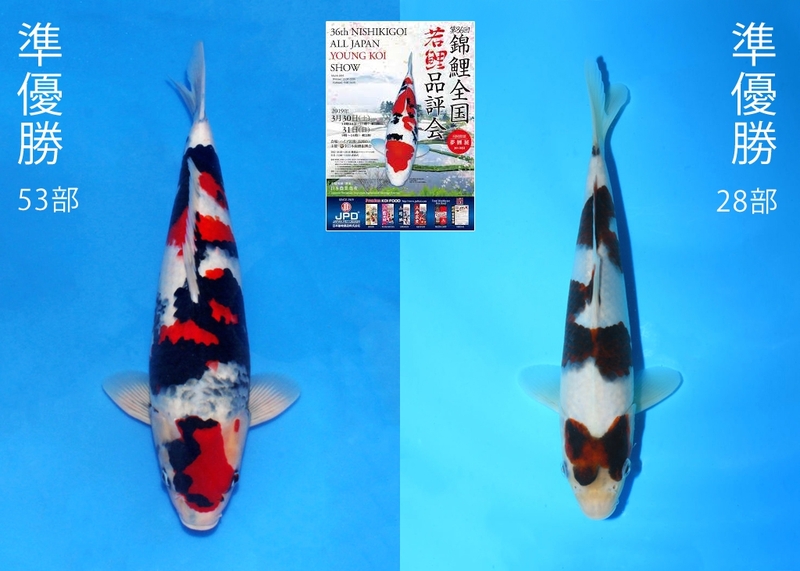 Johns Showa took the 45Bu Doitsu “Jun Yusho” Award at this years All Japan Combined Koi Show back in early February. Just a short time later… after growing a bit and with better developed Sumi she would be entered into her second show of the season, the All Japan Young Koi Show. Johns Doitsu not only took the Champion award for her size and class but the high honor of Tsubaki Prize. The Tsubaki Prize is awarded to the best Koi from the following classes: Goshiki, Kawarigoi, Ginrin A, Ginrin B, Utsuri and Kujaku in each size. Congratulations to our friend Gwenna on receiving the 53bu and 28bu Jun Yusho award at the 2019 All Japan Young Koi Show! This is the first time these two koi have been shown in Japan… both placing at one of the most competitive shows in the world. “Jun Yusho” roughly translates to “Runner up Champion”. There can be one or more of these awards given at the judging teams consensus. The Jun Yusho awards are given to koi that were in the final running for the “Yusho” or Champion Award.